Investment in the new nuclear plant to be built in Hinkley Point, Somerset, is set to get final approval later on Thursday. The French utility, EDF – the company financing most of the £18bn project – is holding a board meeting at which it is expected to approve the investment. Following that agreement, legally-binding contracts will be signed and construction work can begin. It will be the UK’s first new nuclear power plant in more than 20 years. EDF hopes to have more than 2,500 workers on site by next year. Work on Hinkley Point C, which would provide 7% of the UK’s total electricity requirement, had originally been meant to start in 2017. The project has been hit in recent months by concerns about EDF’s financial capacity. 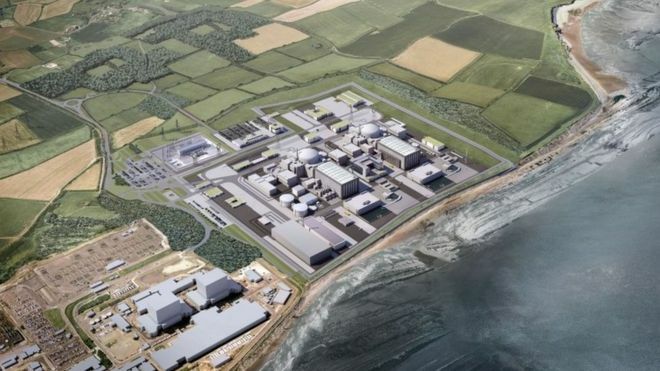 While one third of the £18bn cost of the project is being met by Chinese investors, Hinkley Point would remain an enormous undertaking for the stressed French company. Earlier this week EDF shareholders approved plans to issue new shares to raise 4bn euros (£3.4bn) to help pay for the project. The French state, which owns 85% of EDF, will buy €3bn worth of new shares in the fundraising. Ahead of the decision, EDF said Hinkley Point was a “unique asset for French industry as it would benefit the whole of the nuclear industry and support employment in major companies and smaller enterprises in the sector”. Although French unions are urging the company to push back the decision until the company is in a better financial position, UK unions have welcomed the project. “We urge the EDF board to give the financial go-ahead on a project which will generate thousands of decent skilled jobs and help meet the energy needs of the UK for generations to come,” said Unite national officer for energy Kevin Coyne. Environmentalists are concerned about the plan. Greenpeace said there wasn’t “a shred of evidence that Hinkley can be built on time or on budget, and if it hits the same problems as its predecessors, it can’t be relied on to keep the lights on in the UK”. The campaign group added that more investment for renewable energy like offshore wind was needed.